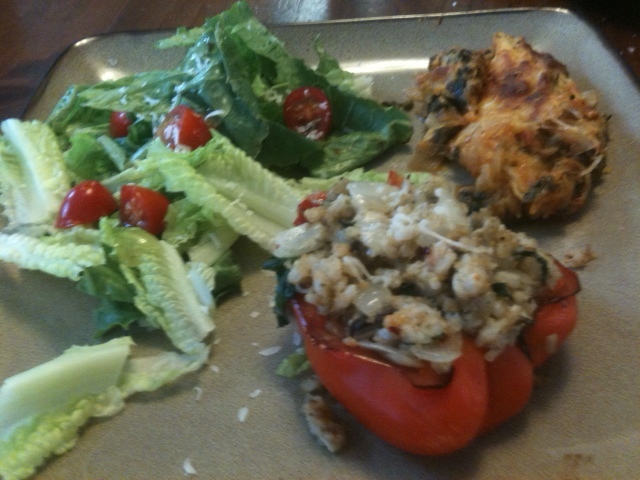 Front right- Stuffed Red Pepper, Back Right- Spinach-Spaghetti Squash Casserole, and of course left- a side salad. It finally happened. I had been contemplating when would be my big move to a meatless meal for Hubs and finally decided just to take the plunge. I was about nervous about it, but Hubs received this recipe with open arms (and open mouth), declaring he would indeed eat this again. 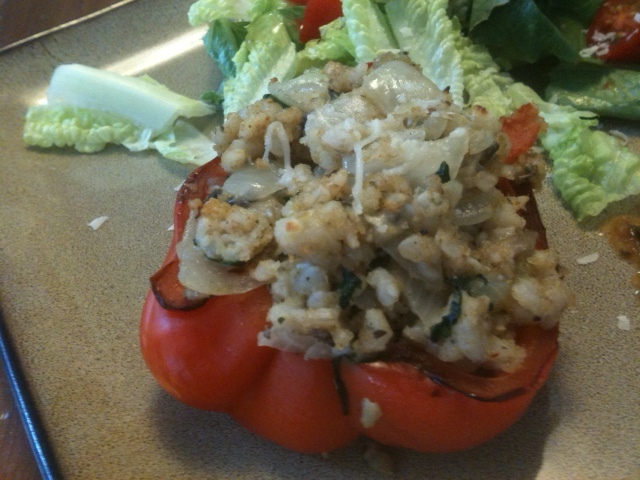 I drew my inspiration for the pepper from Pinterest, but after comparing multiple recipes, I opted to just willy-nilly it and make up my own thing (IT WAS FANTASTIC). 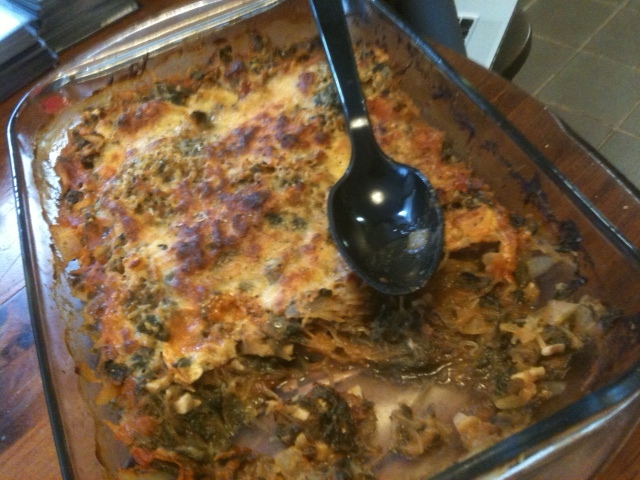 The spinach-spaghetti squash casserole was from Daily Adventures in Cooking, and I of course kinda played with it a bit too. I don’t really follow recipes that often. But below are the recipes and pictures of exactly what I did. I’m telling you– if you’re looking for a yummy vegetarian meal, this is for you. If you’re not willing to skip out on the meat, simply grill a piece of chicken on the side or brown some ground turkey and mix it with the pepper stuffing. 1) Preheat oven to 450 degrees. 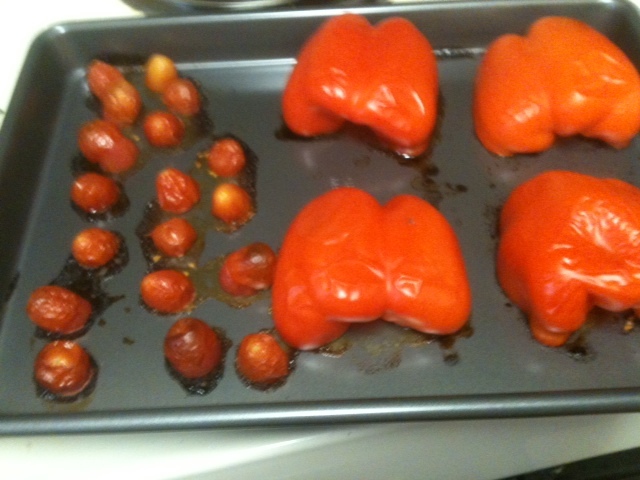 Arrange halved peppers and tomatoes on cookie sheet and bake for about 5 minutes or until the skins start to blacken a bit/look at least a bit wrinkly. Set aside. 2) In a medium sized pan over medium high heat, put the olive oil and garlic. 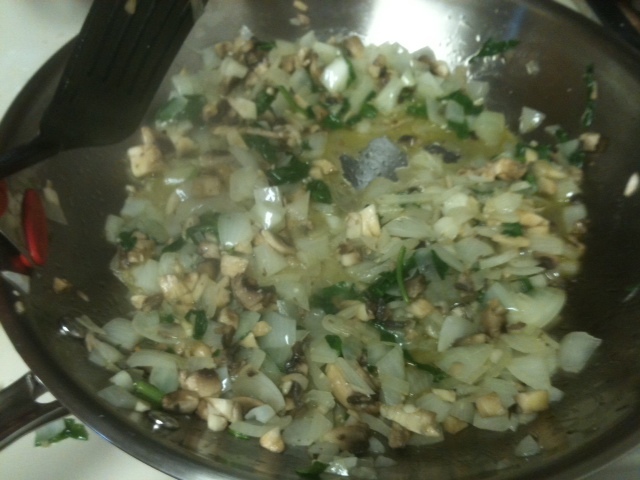 Once the oil is heated, add the onions and mushrooms and cook for about 5 minutes until a little bit browned. 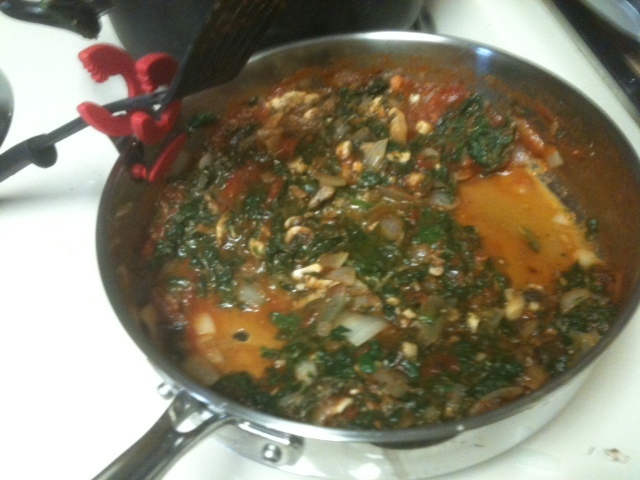 Add the spinach and sautee until wilted. 3) Reduce heat to Medium/Medium-Low. Add the brown rice to the pan and mix thoroughly. Then add the bread crumbs and mix thoroughly again. 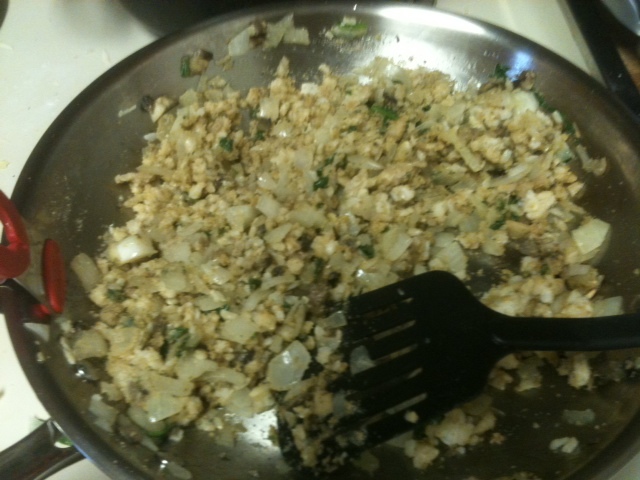 It should start getting clumpy and the bread crumbs should absorb remaining oil/ veggie juices. Use judgement on how much bread crumbs you need. You don’t want it to be too soggy, but you definitely want to avoid it being dry. Then add the roasted tomato halves and cheese. Mix until the cheese is slightly melted. 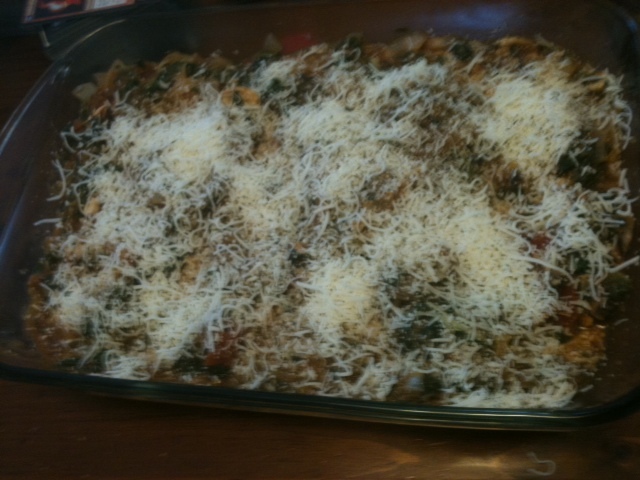 4) Stuff the peppers and sprinkle a little bit of cheese on top if you like. Put back in the oven and bake until cheese on top is slightly melted. Hopefully you have the oven still preheated at 450 from the previous recipe. 1) Cook the spaghetti squash. Either halve it and place it cut sides down on a cookie sheet and bake in the oven for 45 minutes at 350 or you can try microwaving it. This was my first time trying the microwaving trick, and I must say, while quicker, baking it had a better texture. 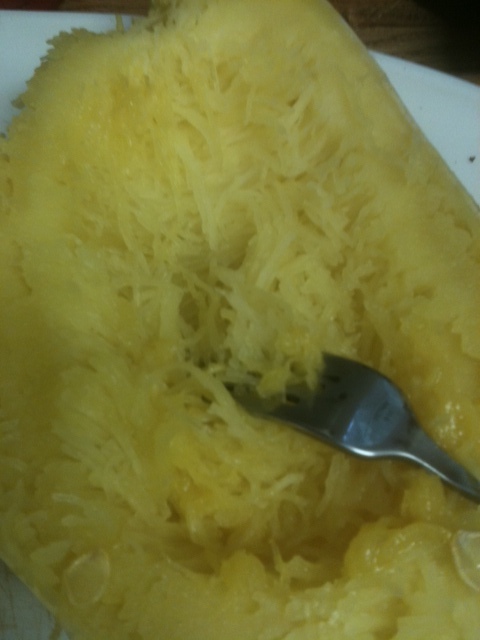 To microwave, put whole spaghetti squash in microwave after making stabs at the rind with a knife. Bake in microwave for 5 minute increments, not to exceed 15 minutes. It is done with the skin is slightly soft to the touch. After cooking, cut in half (if not already in half) and remove seeds and guts. Then take a fork and bring it toward you in one direction, slowly making strands of “noodles” from side. Put in bowl and set aside. 2) In a medium pan on medium heat, place the olive oil and minced garlic, onions, and mushrooms and sautee until onion is soft. If your spinach is still frozen, cook according to instructions in the microwave. Then add to pan. Add tomato sauce and let it simmer for a bit. 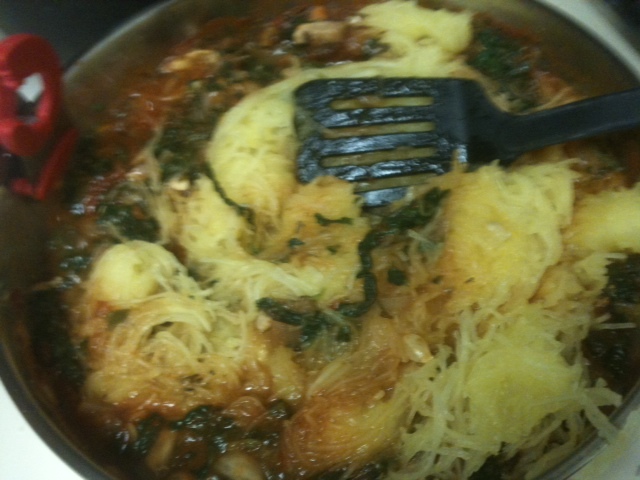 3) Add spaghetti squash, mixing thoroughly, also adding all your seasonings. Then pour mixture in 9″x13″ pan. Cover with cheese and sprinkle with more Italian seasonings if you like. 4) Bake at 450 degrees for 30 minutes, or until cheese is more than bubbly– if not a bit crispy (adds a nice texture for up top).